Two Russian journalists working for Life News TV channel have been detained in Kiev by Ukraine’s Security Service, which says the crew will be expelled from the country and denied entry for five years. The detention was later confirmed by the SBU’s senior adviser, Markian Lubkovsky. “I’d like to confirm that SBU in Kiev detained two citizens of the Russian Federation, Life News journalists,” he wrote on Facebook, adding that the journalists will “in the near future be expelled” from Ukraine and denied entry for five years. “These Russian citizens’ activity has nothing in common with journalism and can be described as harmful to Ukraine’s security and national interests,” Lubkovsky’s post reads. 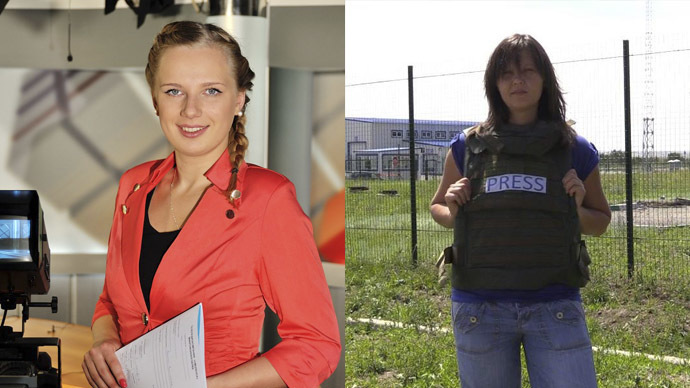 Life News identified the detained as correspondent Elizaveta Khramtsova and photographer Natalia Kalysheva. The channel says Khramtsova managed to make a phone call to the office, before connection with the filming crew was lost. The two women were getting into a taxi to go to film an interview, when two other people got into the same vehicle and showed their SBU IDs. Khramtsova and Kalysheva were apparently told they were being taken for questioning over a phone call warning of a bomb planted at Leo Tolstoy Square in central Kiev. That’s where the two had been waiting for their taxi. Russia’s Foreign Ministry has demanded in a statement Friday that Ukraine release the LifeNews reporters detained in Kiev immediately and stop "intimidating the media." The ministry added that there has been no contact with the reporters since their detention and their whereabouts are not currently known. Moscow “expects a corresponding reaction from related international organizations and first of all from the Organization of Security and Cooperation in Europe’s (OSCE) representative on media freedom, Dunja Mijatovic, to another unlawful incident when Kiev authorities are trying to protect Ukraine's information space from unbiased views of what is happening in the country,” the Foreign Ministry said. Ukraine's Security Service recently estimated that 88 Russian journalists have been deported from the country since the conflict started.